To download a printable version of this document in PDF format, click here. What is the wave theory of light? How did the quantum theory of light come about? What is black body radiation? How did black body radiation lead to quantum physics? What peculiarity of the photoelectric effect led to the photon? Where does relativity come in? Can the mass-less photon have momentum? If waves can be particles, can particles be waves? Exactly what is it that is "waving"? What is the uncertainty principle? Is the uncertainty principle consistent with particle waves? Are they particles or are they waves? How are line spectra organized? How large can n be? Why do line spectra become continuous at short wavelengths? What were the problems with the planetary model of the atom? How did Bohr's theory save the planetary model... for a while? 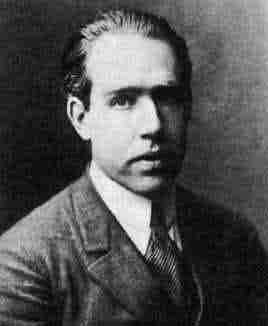 What were the main problems with Bohr's theory? How did the wave picture of the electron save Bohr's theory? If the electron cannot be localized, can it be moving? Why does the electron not fall into the nucleus? How many of the above questions can you answer? Few are likely to show up exactly as given here on your next midterm exam, but the more of these you know something about, the greater your understanding of modern atomic theory is likely to be. You can either click on any you are unsure about, or browse through them by simply scrolling down this page. For a much more detailed treatment of atomic structure and the periodic table, see the Chem1 Virtual Textbook section Atoms and the Periodic Table. Q1. What is a particle? A particle is a discrete unit of matter having the attributes of mass, momentum (and thus kinetic energy) and optionally of electric charge. Q2. What is a wave? A wave is a periodic variation of some quantity as a function of location or time. For example, the wave motion of a vibrating guitar string is defined by the displacement of the string from its center as a function of distance along the string. A sound wave consists of variations in the pressure with location. in which u is the velocity of propagation of the disturbance in the medium. Problem example: The velocity of sound in the air is 330 m s1. What is the wavelength of A440 on the piano keyboard? Two other attributes of waves are the amplitude (the height of the wave crests with respect to the base line) and the phase, which measures the position of a crest with respect to some fixed point. The square of the amplitude gives the intensity of the wave: the energy transmitted per unit time). A unique property of waves is their ability to combine constructively or destructively, depending on the relative phases of the combining waves. Q4. What is the wave theory of light? In the early 19th century, the English scientist Thomas Young carried out the famous two-slit experiment which demonstrated that a beam of light, when split into two beams and then recombined, will show interference effects that can only be explained by assuming that light is a wavelike disturbance. By 1820, Augustin Fresnel had put this theory on a sound mathematical basis, but the exact nature of the waves remained unclear until the 1860's when James Clerk Maxwell developed his electromagnetic theory. From the laws of electromagnetic induction that were discovered in the period 1820-1830 by Hans Christian Oersted and Michael Faraday, it was known that a moving electric charge gives rise to a magnetic field, and that a changing magnetic field can induce electric charges to move. Maxwell showed theoretically that when an electric charge is accelerated (by being made to oscillate within a piece of wire, for example), electrical energy will be lost, and an equivalent amount of energy is radiated into space, spreading out as a series of waves extending in all directions. What is "waving" in electromagnetic radiation? According to Maxwell, it is the strengths of the electric and magnetic fields as they travel through space. The two fields are oriented at right angles to each other and to the direction of travel. These waves consist of periodic variations in the electrostatic and electromagnetic field strengths. These variations occur at right angles to each other. Each electrostatic component of the wave induces a magnetic component, which then creates a new electrostatic component, so that the wave, once formed, continues to propagate through space, essentially feeding on itself. In one of the most brilliant mathematical developments in the history of science, Maxwell expounded a detailed theory, and even showed that these waves should travel at about 3E8 m s1, a value which experimental observations had shown corresponded to the speed of light. In 1887, the German physicist Heinrich Hertz demonstrated that an oscillating electric charge (in what was in essence the world's first radio transmitting antenna) actually does produce electromagnetic radiation just as Maxwell had predicted, and that these waves behave exactly like light. It is now understood that light is electromagnetic radiation that falls within a range of wavelengths that can be perceived by the eye. The entire electromagnetic spectrum runs from radio waves at the long-wavelength end, through heat, light, X-rays, and to gamma radiation. Q5. How did the quantum theory of light come about? It did not arise from any attempt to explain the behavior of light itself; by 1890 it was generally accepted that the electromagnetic theory could explain all of the properties of light that were then known. Certain aspects of the interaction between light and matter that were observed during the next decade proved rather troublesome, however. The relation between the temperature of an object and the peak wavelength emitted by it was established empirically by Wilhelm Wien in 1893. This put on a quantitative basis what everyone knows: the hotter the object, the "bluer" the light it emits. Q6. What is black body radiation? At ordinary temperatures this radiation is entirely in the infrared region of the spectrum, but as the temperature rises above about 1000K, more energy is emitted in the visible wavelength region and the object begins to glow, first with red light, and then shifting toward the blue as the temperature is increased. This type of radiation has two important characteristics. First, the spectrum is a continuous one, meaning that all wavelengths are emitted, although with intensities that vary smoothly with wavelength. The other curious property of black body radiation is that it is independent of the composition of the object; all that is important is the temperature. Q7. How did black body radiation lead to quantum physics? Black body radiation, like all electromagnetic radiation, must originate from oscillations of electric charges which in this case were assumed to be the electrons within the atoms of an object acting somewhat as miniature Hertzian oscillators. It was presumed that since all wavelengths seemed to be present in the continuous spectrum of a glowing body, these tiny oscillators could send or receive any portion of their total energy. However, all attempts to predict the actual shape of the emission spectrum of a glowing object on the basis of classical physical theory proved futile. 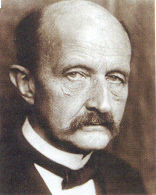 In 1900, the great German physicist Max Planck (who earlier in the same year had worked out an empirical formula giving the detailed shape of the black body emission spectrum) showed that the shape of the observed spectrum could be exactly predicted if the energies emitted or absorbed by each oscillator were restricted to integral values of hν, where ν ("nu") is the frequency and h is a constant 6.626E34 J s which we now know as Planck's Constant. The allowable energies of each oscillator are quantized, but the emission spectrum of the body remains continuous because of differences in frequency among the uncountable numbers of oscillators it contains.This modification of classical theory, the first use of the quantum concept, was as unprecedented as it was simple, and it set the stage for the development of modern quantum physics. Q8. 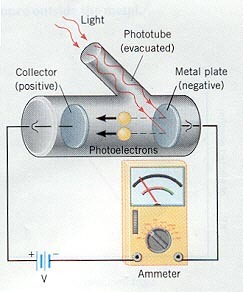 What is the photoelectric effect? These two diagrams are taken from a Web page by Joseph Alward of the University of the Pacific. 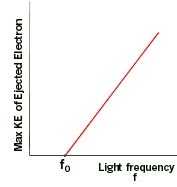 The plot at the right shows how the kinetic energy of the photoelectrons falls to zero at the critical wavelength corresponding to frequency f0. Q9. What peculiarity of the photoelectric effect led to the photon? Although the number of electrons ejected from the metal surface per second depends on the intensity of the light, as expected, the kinetic energies of these electrons (as determined by measuring the retarding potential needed to stop them) does not, and this was definitely not expected. Just as a more intense physical disturbance will produce higher energy waves on the surface of the ocean, it was supposed that a more intense light beam would confer greater energy on the photoelectrons. But what was found, to everyone's surprise, is that the photoelectron energy is controlled by the wavelength of the light, and that there is a critical wavelength below which no photoelectrons are emitted at all. Einstein's publication of this explanation in 1905 led to the rapid acceptance of Planck's idea of energy quantization, which had not previously attracted much support from the physics community of the time. It is interesting to note, however, that this did not make Planck happy at all. Planck, ever the conservative, had been reluctant to accept that his own quantized-energy hypothesis was much more than an artifice to explain black-body radiation; to extend it to light seemed an absurdity that would negate the well-established electromagnetic theory and would set science back to the time before Maxwell. Q10. Where does relativity come in? in which mo is the rest mass of the particle, v is its velocity with respect to the observer, and c is the velocity of light. The only particle that can move at the velocity of light is the photon itself, due to its zero rest mass. Q11. Can the mass-less photon have momentum? Q12. If waves can be particles, can particles be waves? 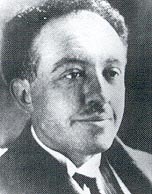 In 1924, the French physicist Louis deBroglie proposed (in his doctoral thesis) that just as light possesses particle-like properties, so should particles of matter exhibit a wave-like character. Within two years this hypothesis had been confirmed experimentally by observing the diffraction (a wave interference effect) produced by a beam of electrons as they were scattered by the row of atoms at the surface of a metal. Notice that the wavelength of a stationary particle is infinitely large, while that of a particle of large mass approaches zero. For most practical purposes, the only particle of interest to chemistry that is sufficiently small to exhibit wavelike behavior is the electron (mass 9.11E­31 kg). Q13. Exactly what is it that is "waving"? We pointed out earlier that a wave is a change that varies with location in a periodic, repeating way. What kind of a change do the crests and hollows of a "matter wave" trace out? The answer is that the wave represents the value of a quantity whose square is a measure of the probability of finding the particle in that particular location. In other words, what is "waving" is the value of a mathematical probability function. Q14. What is the uncertainty principle? As with the de Broglie particle wavelength, this has practical consequences only for electrons and other particles of very small mass. It is very important to understand that these "uncertainties" are not merely limitations related to experimental error or observational technique, but instead they express an underlying fact that Nature does not allow a particle to possess definite values of position and momentum at the same time. This principle (which would be better described by the term "indeterminacy" than "uncertainty") has been thoroughly verified and has far-reaching practical consequences which extend to chemical bonding and molecular structure. For an interactive demonstration, see here. Q15. Is the uncertainty principle consistent with particle waves? But if the peaks of the wave represent locations at which the particle is most likely to manifest itself, we are forced to the conclusion that it can "be" virtually anywhere, since the number of such peaks is infinite! Now think of the opposite extreme: a particle whose location is closely known. Such a particle would be described by a short wavetrain having only a single peak, the smaller the uncertainty in position, the more narrow the peak. Is such a wave possible, and if so, what is its wavelength? Such a wave is possible, but only as the sum (interference) of other waves whose wavelengths are all slightly different. Each component wave possesses its own energy (momentum), and adds that value to the range of momenta carried by the particle, thus increasing the uncertainty δp. 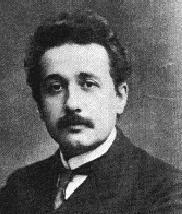 In the extreme case of a quantum particle whose location is known exactly, the probability wavelet would have zero width which could be achieved only by combining waves of all wavelengths-- an infinite number of wavelengths, and thus an infinite range of momentum dp and thus kinetic energy. Q16. Are they particles or are they waves? Suppose we direct a beam of photons (or electrons; the experiment works with both) toward a piece of metal having a narrow opening. On the other side there are two more openings, or slits. Finally the particles impinge on a photographic plate or some other recording device. Taking into account their wavelike character, we would expect the probability waves to produce an interference pattern of the kind that is well known for sound and light waves, and this is exactly what is observed; the plate records a series of alternating dark and light bands, thus demonstrating beyond doubt that electrons and light have the character of waves. Now let us reduce the intensity of the light so that only one photon at a time passes through the apparatus (it is experimentally possible to count single photons, so this is a practical experiment). Each photon passes through the first slit, and then through one or the other of the second set of slits, eventually striking the photographic film where it creates a tiny dot. If we develop the film after a sufficient number of photons have passed through, we find the very same interference pattern we obtained previously. There is something strange here. Each photon, acting as a particle, must pass through one or the other of the pair of slits, so we would expect to get only two groups of spots on the film, each opposite one of the two slits. Instead, it appears that the each particle, on passing through one slit, "knows" about the other, and adjusts its final trajectory so as to build up a wavelike interference pattern. It gets even stranger: suppose that we set up a detector to determine which slit a photon is heading for, and then block off the other slit with a shutter. We find that the photon sails straight through the open slit and onto the film without trying to create any kind of an interference pattern. Apparently, any attempt to observe the photon as a discrete particle causes it to behave like one. The only conclusion possible is that quantum particles have no well defined paths; each photon (or electron) seems to have an infinity of paths which thread their way through space, seeking out and collecting information about all possible routes, and then adjusting its behavior so that its final trajectory, when combined with that of others, produces the same overall effect that we would see from a train of waves of wavelength λ= h/mv. See here for another description of the two-slit experiment. Q17. What are line spectra? We have already seen that a glowing body (or actually, any body whose temperature is above absolute zero) emits and absorbs radiation of all wavelength in a continuous spectrum. In striking contrast is the spectrum of light produced when certain substances are volatilized in a flame, or when an electric discharge is passed through a tube containing gaseous atoms of an element. The light emitted by such sources consists entirely of discrete wavelengths. This kind of emission is known as a discrete spectrum or line spectrum (the "lines" that appear on photographic images of the spectrum are really images of the slit through which the light passes before being dispersed by the prism in the spectrograph). Every element has its own line spectrum which serves as a sensitive and useful tool for detecting the presence and relative abundance of the element, not only in terrestrial samples but also in stars. (As a matter of fact, the element helium was discovered in the sun, through its line spectrum, before it had been found on Earth.) In some elements, most of the energy in the visible part of the emission spectrum is concentrated into just a few lines, giving their light characteristic colors: yellow-orange for sodium, blue-green for mercury (these are commonly seen in street lights) and orange for neon. Line spectra were well known early in the 19th century, and were widely used for the analysis of ores and metals. The German spectroscopist R.W. Bunsen, now famous for his gas burner, was then best known for discovering two new elements, rubidium and cesium, from the line spectrum he obtained from samples of mineral spring waters. Q18. How are line spectra organized? in which m = 2 and R is a constant (the Rydberg constant, after the Swedish spectroscopist) whose value is 1.09678E7 m1. The variable n is an integer whose values 1, 2, etc. give the wavelengths of the different lines. It was soon discovered that by replacing m with integers other than 2, other series of hydrogen lines could be accounted for. These series, which span the wavelength region from the ultraviolet through infrared, are named after their discoverers. Attempts to adapt Balmer's formula to describe the spectra of atoms other than hydrogen generally failed, although certain lines of some of the spectra seemed to fit this same scheme, with the same value of R.
Q19. How large can n be? There is no limit; values in the hundreds have been observed, although doing so is very difficult because of the increasingly close spacing of successive levels as n becomes large. Atoms excited to very high values of n are said to be in Rydberg states. Q20. Why do line spectra become continuous at short wavelengths? As n becomes larger, the spacing between neighboring levels diminishes and the discrete lines merge into a continuum. This can mean only one thing: the energy levels converge as n approaches infinity. This convergence limit corresponds to the energy required to completely remove the electron from the atom; it is the ionization energy. At energies in excess of this, the electron is no longer bound to the rest of the atom, which is now of course a positive ion. But an unbound system is not quantized; the kinetic energy of the ion and electron can now have any value in excess of the ionization energy. When such an ion and electron pair recombine to form a new atom, the light emitted will have a wavelength that falls in the continuum region of the spectrum. Spectroscopic observation of the convergence limit is an important method of measuring the ionization energies of atoms. Q21. What were the problems with the planetary model of the atom? Rutherford's demonstration that the mass and the positive charge of the atom is mostly concentrated in a very tiny region called the nucleus forced the question of just how the electrons are disposed outside the nucleus. By analogy with the solar system, a planetary model was suggested: if the electrons were orbiting the nucleus, there would be a centrifugal force that could oppose the electrostatic attraction and thus keep the electrons from falling into the nucleus. This of course is similar to the way in which the centrifugal force produced by an orbiting planet exactly balances the force due to its gravitational attraction to the sun. The planetary model suffers from one fatal weakness: electrons, unlike planets, are electrically charged. An electric charge revolving in an orbit is continually undergoing a change of direction, that is, acceleration. It has been well known since the time of Hertz that an accelerating electric charge radiates energy. We would therefore expect all atoms to act as miniature radio stations. Even worse, conservation of energy requires that any energy that is radiated must be at the expense of the kinetic energy of the orbital motion of the electron. 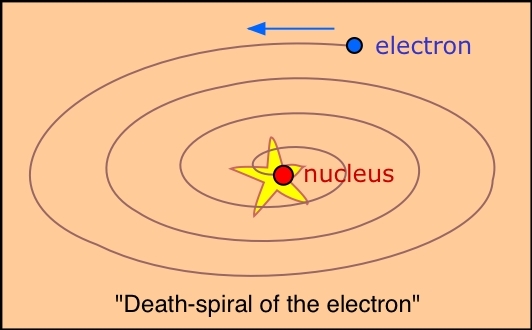 Thus the electron would slow down, reducing the centrifugal force and allowing the electron to spiral closer and closer to the nucleus, eventually falling into it. In short, no atom that operates according to the planetary model would last long enough for us to talk about it. As if this were not enough, the planetary model was totally unable to explain any of the observed properties of atoms, including their line spectra. Q22. How did Bohr's theory save the planetary model... for a while? Niels Bohr was born in the same year (1885) that Balmer published his formula for the line spectrum of hydrogen. Beginning in 1913, the brilliant Danish physicist published a series of papers that would ultimately derive Balmer's formula from first principles. Bohr's first task was to explain why the orbiting electron does not radiate energy as it moves around the nucleus. This energy loss, if it were to occur at all, would do so gradually and smoothly. But Planck had shown that black body radiation could only be explained if energy changes were limited to jumps instead of gradual changes. If this were a universal characteristic of energy- that is, if all energy changes were quantized, then very small changes in energy would be impossible, so that the electron would in effect be "locked in" to its orbit. From this, Bohr went on to propose that there are certain stable orbits in which the electron can exist without radiating and thus without falling into a "death spiral". This supposition was a daring one at the time because it was inconsistent with classical physics, and the theory which would eventually lend it support would not come along until the work of de Broglie and Heisenberg more than ten years later. Each orbit corresponds to a different energy, with the electron normally occupying the one having the lowest energy, which would be the innermost orbit of the hydrogen atom. Taking the lead from Einstein's explanation of the photoelectric effect, Bohr assumed that each spectral line emitted by an atom that has been excited by absorption of energy from an electrical discharge or a flame represents a change in energy given by ΔE = hn = hc/λ, the energy lost when the electron falls from a higher orbit (value of n) into a lower one. Substitution of the observed values of the electron mass and electron charge into this equation yielded a value of 0.529E­10 m for the radius of the first orbit, a value that corresponds to the radius of the hydrogen atom obtained experimentally from the kinetic theory of gases. Bohr was also able to derive a formula giving the value of the Rydberg constant, and thus in effect predict the entire emission spectrum of the hydrogen atom. Q23. What were the main problems with Bohr's theory? There were two kinds of difficulties. First, there was the practical limitation that it only works for atoms that have one electron-- that is, for H, He+, Li2+, etc. The second problem was that Bohr was unable to provide any theoretical justification for his assumption that electrons in orbits described by the preceding equation would not lose energy by radiation. This reflects the fundamental underlying difficulty: because de Broglie's picture of matter waves would not come until a decade later, Bohr had to regard the electron as a classical particle traversing a definite orbital path. Q24. How did the wave picture of the electron save Bohr's theory? Once it became apparent that the electron must have a wavelike character, things began to fall into place. The possible states of an electron confined to a fixed space are in many ways analogous to the allowed states of a vibrating guitar string. These states are described as standing waves that must possess integral numbers of nodes. The states of vibration of the string are described by a series of integral numbers n = 1,2,... which we call the fundamental, first overtone, second overtone, etc. The energy of vibration is proportional to n2. Each mode of vibration contains one more complete wave than the one below it. In exactly the same way, the mathematical function that defines the probability of finding the electron at any given location within a confined space possesses n peaks and corresponds to states in which the energy is proportional to n2. The electron in a hydrogen atom is bound to the nucleus by its spherically symmetrical electrostatic charge, and should therefore exhibit a similar kind of wave behavior. This is most easily visualized in a two-dimensional cross section that corresponds to the conventional electron orbit. But if the particle picture is replaced by de Broglie's probability wave, this wave must follow a circular path, and- most important of all- its wavelength (and consequently its energy) is restricted to integral multiples n = 1,2,.. of the circumference 2πr = nλ. for otherwise the wave would collapse owing to self-interference. That is, the energy of the electron must be quantized; what Bohr had taken as a daring but arbitrary assumption was now seen as a fundamental requirement. Indeed the above equation can be derived very simply by combining Bohr's quantum condition 2πrmv = nh with the expression mv = h/λ for the deBroglie wavelength of a particle. Viewing the electron as a standing-wave pattern also explains its failure to lose energy by radiating. Classical theory predicts that an accelerating electric charge will act as a radio transmitter; an electron traveling around a circular wire would certainly act in this way, and so would one rotating in an orbit around the nucleus. In a standing wave, however, the charge is distributed over space in a regular and unchanging way; there is no motion of the charge itself, and thus no radiation. Q25. What is an orbital? Because the classical view of an electron as a localizable particle is now seen to be untenable, so is the concept of a definite trajectory, or "orbit". Instead, we now use the word orbital to describe the state of existence of an electron. An orbital is really no more than a mathematical function describing the standing wave that gives the probability of the electron manifesting itself at any given location in space. More commonly (and loosely) we use the word to describe the region of space in which an electron is likely to be found. Each kind of orbital is characterized by a set of quantum numbers n, l, and m These relate, respectively, to the average distance of the electron from the nucleus, to the shape of the orbital, and to its orientation in space. Q26. If the electron cannot be localized, can it be moving? In its lowest state in the hydrogen atom (in which l=0) the electron has zero angular momentum, so electrons in s orbitals are not in motion. In orbitals for which l>0 the electron does have an effective angular momentum, and since the electron also has a definite rest mass me = 9.11E­31 kg, it must possess an effective velocity. Its value can be estimated from the Uncertainty Principle; if the volume in which the electron is confined is about 1010 m, then the uncertainty in its momentum is at least h/(1010) = 6.6E24 kg m s1, which implies a velocity of around 107 m s1, or almost one-tenth the velocity of light. The stronger the electrostatic force of attraction by the nucleus, the faster the effective electron velocity. In fact, the innermost electrons of the heavier elements have effective velocities so high that relativistic effects set in; that is, the effective mass of the electron significantly exceeds its rest mass. This has direct chemical effects; it is the cause, for example, of the low melting point of metallic mercury and of the color of gold. Q27. Why does the electron not fall into the nucleus? "How the battle of the infinities saves the electron from its death spiral". The negatively-charged electron is attracted to the positive charge of the nucleus. What prevents it from falling in? This question can be answered in various ways at various levels. All start with the statement that the electron, being a quantum particle, has a dual character and cannot be treated solely by the laws of Newtonian mechanics. We saw above that in its wavelike guise, the electron exists as a standing wave which must circle the nucleus at a sufficient distance to allow at least one wavelength to fit on its circumference. This means that the smaller the radius of the circle, the shorter must be the wavelength of the electron, and thus the higher the energy. Thus it ends up "costing" the electron energy if it gets too close to the nucleus. The normal orbital radius represents the balance between the electrostatic force trying to pull the electron in, and what we might call the "confinement energy" that opposes the electrostatic energy. This confinement energy can be related to both the particle and wave character of the electron. If the electron as a particle were to approach the nucleus, the uncertainty in its position would become so small (owing to the very small volume of space close to the nucleus) that the momentum, and therefore the energy, would have to become very large. The electron would, in effect, be "kicked out" of the nuclear region by the confinement energy. in which n = 1,2,3. etc. Q28. What is electron spin? Each electron in an atom has associated with it a magnetic field whose direction is quantized; there are only two possible values that point in opposite directions. We usually refer to these as "up" and "down", but the actual directions are parallel and antiparallel to the local magnetic field associated with the orbital motion of the electron. The term spin implies that this magnetic moment is produced by the electron charge as the electron rotates about its own axis. Although this conveys a vivid mental picture of the source of the magnetism, the electron is not an extended body and its rotation is meaningless. Electron spin has no classical counterpart and no simple explanation; the magnetic moment is a consequence of relativistic shifts in local space and time due to the high effective velocity of the electron in the atom. This effect was predicted theoretically by P.A.M. Dirac in 1928. The Orbitron: a gallery of orbitals - Mark Winter of Sheffield U. has compiled this very nice collection of images representing orbitals, animated plots of wave functions and orbitals, "dot-density" plots of electron density and plots of radial distribution functions. Atomic structure and the periodic table - this section of the Chem1 Virtual Textbook provides thorough coverage of this topic at the first-year chemistry level. Feynman, Richard P.: QED: the strange theory of light and matter. Princeton University Press, 1985.
please see the Chem1 Virtual Textbook home page.